During the holiday season, make sure your elderly loved one has plenty of opportunities to participate in some fun with the rest of the family. 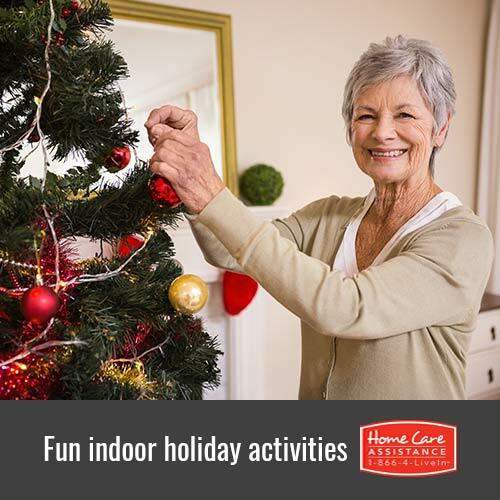 Harrisburg senior care experts suggest helping your loved one get into the holiday spirit by trying some of the entertaining activities below. Take time to go to the movies to see holiday films or watch classic Christmas films at home. This type of social bonding can help your loved one rejuvenate his or her mind and relieve stress, and it can be an uplifting experience to help him or her momentarily forget about age-related complications. Baking holiday recipes can help seniors have fun and get into the holiday spirit. Your loved one may have been known for his or her famous Christmas cookies or pies, which is why you should help keep this tradition alive. If your loved one has begun to rely on a Harrisburg hourly caregiver to prepare meals, he or she may miss the kitchen activity. Baking could help boost your loved one’s esteem around the holidays and help stoke feelings of accomplishment. Many seniors love being around family members and friends during the holidays, which is why you should consider hosting a holiday luncheon at your or your loved one’s home. The anticipation of the luncheon can help your loved one remain motivated during the holiday season because he or she will have something to look forward to. This is also a way for him or her to socialize with others, which could prevent depression, an emotion seniors often experience during the holidays. Have your loved one help you plan the luncheon, complete with food and holiday music. You can also play games that encourage brain stimulation, such as Christmas Bingo. This activity can be done using current photos or photos from past Christmas celebrations. You can even have your loved one’s grandchildren help out. If your loved one has an illness such as Alzheimer’s disease, reminiscing can be a great way to help increase his or her brain activity. Looking at photos can help your loved one remember family members and friends he or she may have forgotten due to memory loss. Decorating a Christmas tree is a traditional holiday activity your loved one may enjoy. You can make this a group effort by having other family members come over to help. Decorating is a great way for your loved one to increase hand-eye coordination. He or she may also enjoy going to see light festivals or driving through the neighborhood to look at the decorations on other homes. This may help your loved one get into the holiday spirit and allow him or her to continue with familiar traditions. The holiday season can be a busy time for many families. If you have concerns your loved one is not receiving the care he or she needs, reach out to Home Care Assistance. Our caregivers are not only trained to assist seniors with a wide variety of tasks, but they can also act as compassionate companions who can bond with your loved one on a personal level. For information on dementia and Alzheimer’s home care in Harrisburg or the many other senior care services offered by Home Care Assistance, call (717) 540-4663 today.